Posted on February 3, 2017 by Matthew Leib. This entry was posted in Spotlight, Staff Stories and tagged dare to do, staff story, UWMC. Bookmark the permalink. While some might look at a scale with a sense of dread, Hilary Law only saw opportunity. 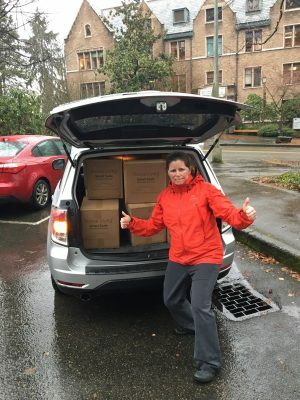 When the heart failure transition nurse at the University of Washington Medical Center received an email in late November about The Whole U’s plan to distribute digital scales donated by Pivotal Digital to the first 1000 registrants for its Dare to Do 30-day Challenge, something clicked. Law operates from a unique position in the cardiology unit on the 5th floor of UWMC. As the Heart Failure Transition Nurse, she works closely with inpatients with heart failure, managing a caseload of between 40 and 60 patients with a special focus on those deemed a higher risk for readmission within 30 days of their release from the hospital. She provides patient education and resources, but all too often, she says, patients could benefit from more help with health-monitoring essentials they can’t always access or afford. In Law’s line of work, scales are among the most essential tools for patient recovery. As part of the recovery process, it’s imperative that those with heart failure monitor their weight daily. Gains of as little as three pounds in one day or five pounds in two can be a sign of dangerous fluid buildup. When fluids build up—often triggered by high-sodium levels in the body—failing hearts can’t pump well against the high pressure, creating what Law calls “a domino effect of health problems” that carry troubling implications for both the individual (about half of people who develop heart failure die within 5 years of diagnosis) and the healthcare system as a whole. Heart failure costs the country an estimated $30.7 billion each year and when approximately 25% of people discharged with heart failure are readmitted nationally, it becomes necessary to bring that percentage down. Hilary Law poses with more than 100 donated scales after the Dare to Do 2017 Seattle campus kick off event January 17 at the HUB. But something as simple as weighing oneself once a day can pose a huge challenge for those living with heart failure, especially if patients live alone or if constrained means and medical costs make buying a scale prohibitively expensive. “A scale gives patients a tool that helps them be more proactive in their care at home,” Law says. In other words, take away that initial hurdle of acquiring one and outpatients are better positioned to address their whole care regimen on their own terms. When the call went out to Dare to Do participants to consider donating their scales, Law says she initially hoped to receive around 10. So far, she has received more than 115, with more on the way, amounting to a veritable stockpile against what had previously been at her disposal. Nobody wants to be a scale-monger—especially not one so well attuned to the positive impact of having access to one. Law acknowledges one of the challenges of her position is the desire to provide patients all possible resources for their health, but recognizing she can’t do it all. Even the small act of giving helps Law to establish stronger patient relationships when building trust and rapport can sometimes pose a major challenge to achieving positive health outcomes. She says the most rewarding part of the work is the chance to sit down with patients and talking with them—not to them—about living with heart failure. She strives to develop a connection with patients so that if they find they’re in trouble, they are compelled to communicate with her and the cardiac team and not just wait it out. Law’s sense of looking out for others pre-dates her decision to enter nursing. Growing up in Tacoma, she recalls the positive interactions she had with neighbors and others in the community regarding her father’s work as a physician. In college, she majored in Environmental Science with an eye to becoming a veterinarian or marine biologist before a love of skiing drew her to Colorado to become a ski instructor. In addition to serving as a ski instructor at Breckenridge and occasionally driving the mountain’s shuttle bus, she worked with people with disabilities helping teach adaptive sports at the Breckinridge Outdoor Education Center. It would prove to be the beginning of Law’s journey helping people find the power to make a lasting difference in their own lives and health. After four years in Colorado, she returned home to Washington to be closer to her family (she still frequently goes skiing with her father). She received her second undergraduate degree through the UW School of Nursing’s 15-month accelerated program and began working as a floor nurse in the Cardiac Clinic at UWMC. Five years on, she was on her way to obtain her masters to become a Clinical Nurse Leader when management on her unit mentioned there was going to be a position opening that was right up her alley. 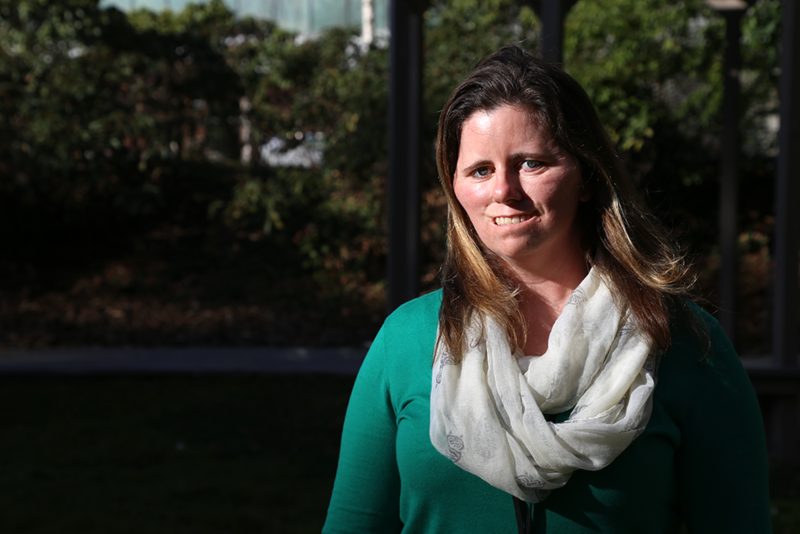 “It was perfect,” she says of the creation of the Heart Failure Transition Nurse position she’s held for the past four years since completing the masters program. For Law, serendipity seems to work both ways, but it is evident more than luck is required to effect positive outcomes. It takes heart on a human scale. At the Dare to Do Seattle campus kickoff January 17, keynote speaker and UW women’s golf coach Mary Lou Mulflur commended Law’s proactive thinking in identifying a need and addressing it through the collective effort of the UW community. For her part, Law says she was simply looking out for the patients in her charge and her fellow workers in the Cardiology Department. It’s as much about changing how patients approach caring for their own health as it is how we choose to care for one another. To that end, Law imparts a final message.